There’s a definite formula when it comes to customizing motorcycles. 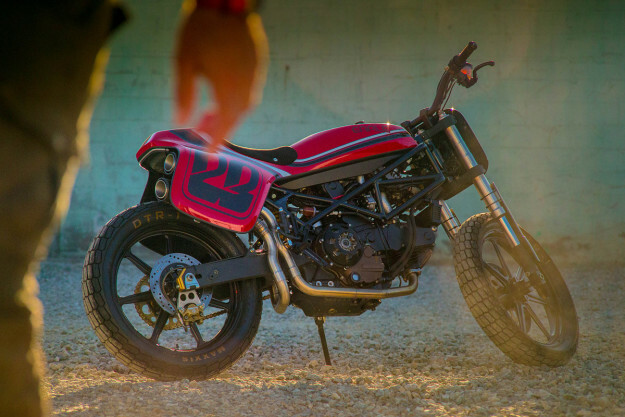 After all, there are only so many ways you can change the look of a bike without resorting to extreme (and expensive) fabrication. But there are a few builders who throw the rulebook out of the window, freely experimenting with new shapes and styles. 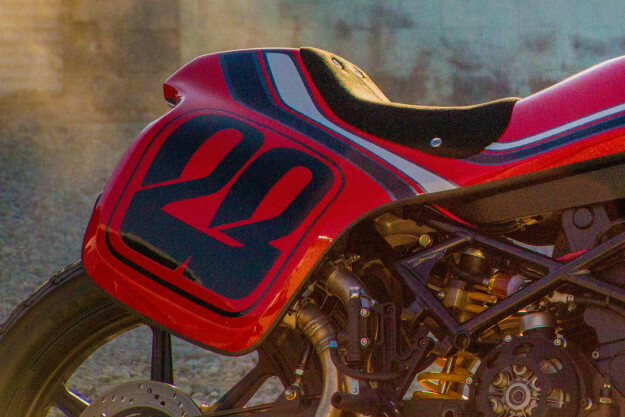 In Europe, Fred Krugger and El Solitario spring to mind; in the US, Revival Cycles and Max Hazan frequently push the limits. 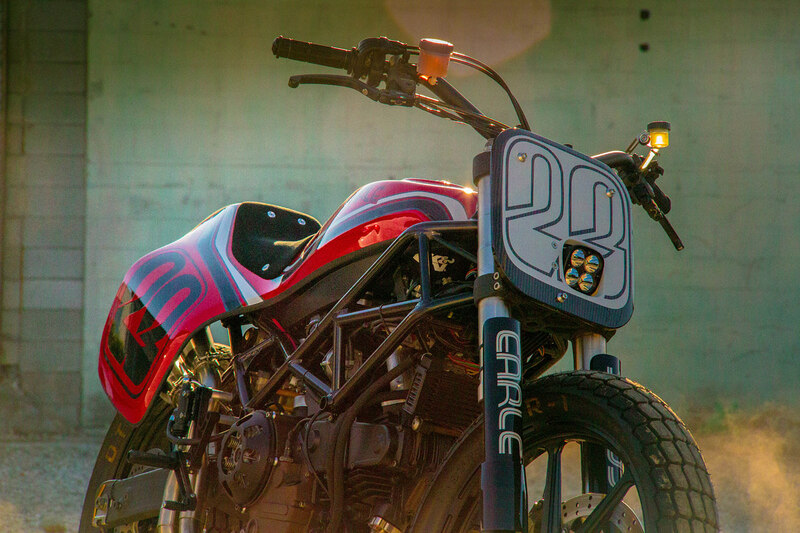 Gustavo Pena of Apogee Motoworks is another one of those pioneers. 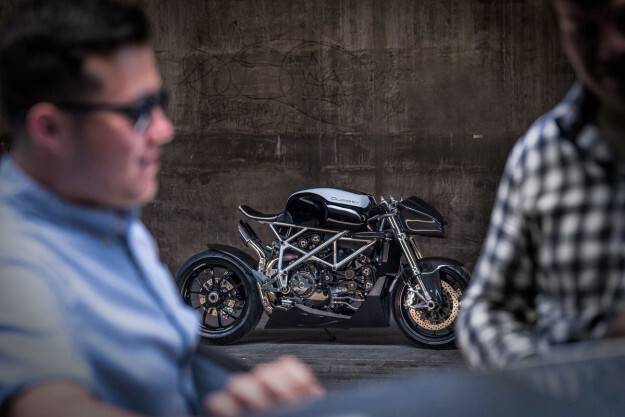 The LA-based cinematographer builds extraordinary Ducatis that look like nothing else on earth. 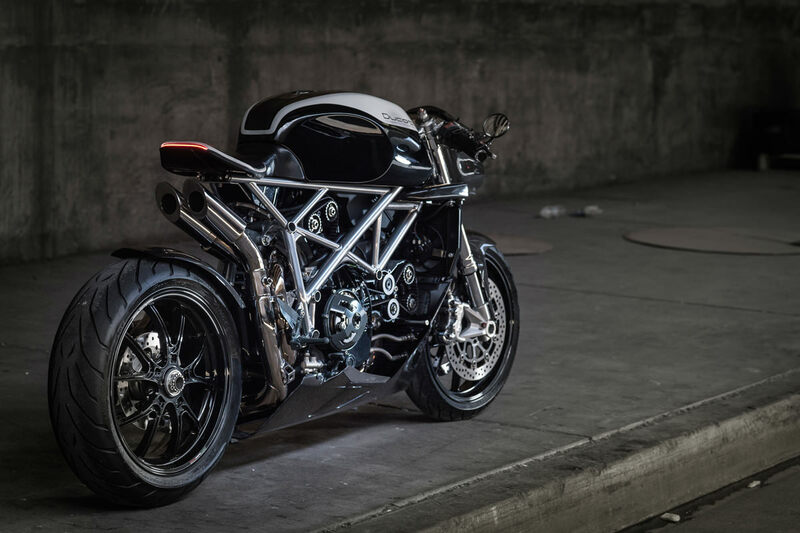 This is his latest creation, “Le Caffage”—a 2009-spec Ducati 848 worthy of a starring role in Tron. Gustavo set out to design a bike that looks futuristic, but has elements of neo-classic style too. 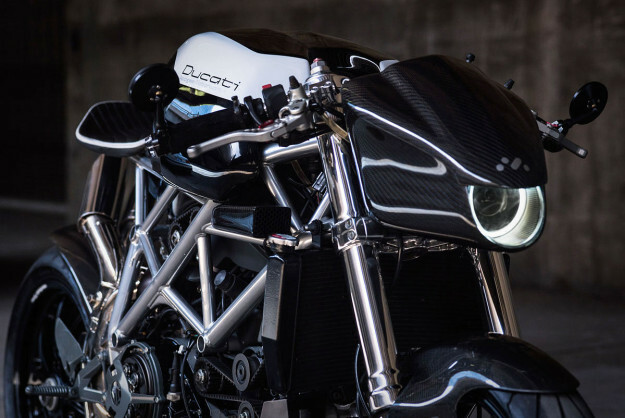 “As if Ducati produced a bike in 2050 paying homage to a bike from 2030,” he says. The design elements are very deliberate, dominated by an oversized gas tank with vintage café proportions. Gustavo has also modified the trellis frame to edge it closer to traditional lines, flowing into an minimalist but comfortable saddle. The twin exhausts—handcrafted in stainless steel—mirror the voluptuous curves of the upper bodywork. But the most attention-grabbing aspect is the headlight, an aggressively lidded design that also houses the speedo and adds an air of menace to the machine. “A normal round drum headlight from eBay would just not cut it!” says Gustavo. 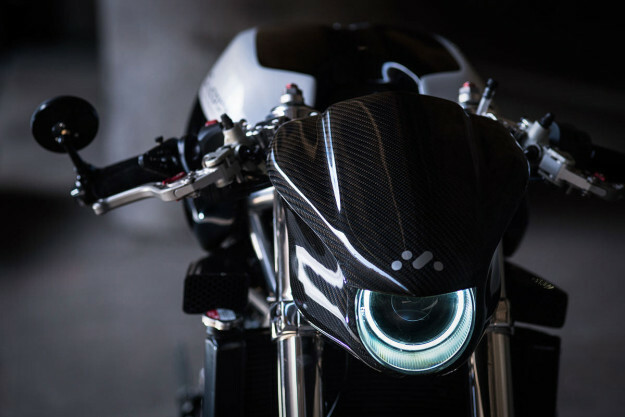 Guided by the volume and silhouette of the fuel tank, he’s shaped the carbon fiber headlight to accentuate the 848’s predatory stance—”Like that of a lion, a bull, or a shark.” Gustavo also found inspiration from his Russian girlfriend: her cheekbones suggested the delicate lines and chiseled side profile of the headlight. Eagle-eyed petrolheads will spot that the LED light unit itself is lifted from a BMW i8. 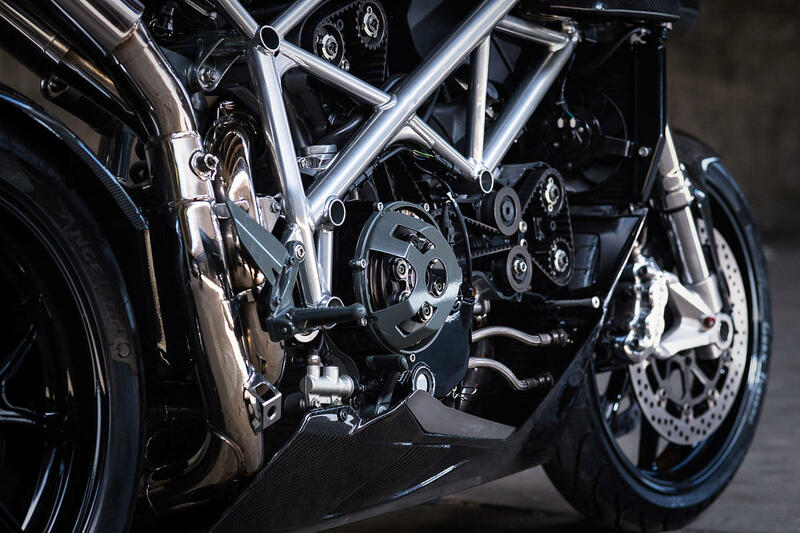 The 848 engine has been heavily upgraded with NCR parts, including titanium valves, a slipper clutch, and a full set of titanium bolts and fasteners. The pistons are from Ferracci and the titanium connecting rods are from Pankl. Rather than hide the typical superbike radiator, Gustavo has designed carbon fiber structural intakes with the help of a composite specialist from F1. They neatly blend with the 848’s immense radiator and the imposing gas tank. South of the radiator is more carbon fiber, this time a belly pan that shrouds the oil cooler and lower part of the engine. Then the entire front and rear suspension was disassembled. Every single aluminum part has been polished to a jewel-quality finish, and then sprayed with a 3M sealant to keep it maintenance free. Many other parts have been powder coated and then treated to a ceramic coating on top—including the entire trellis frame, the swingarm, rear sets and the forged Marchesini racing wheels. Both wheels are shrouded with custom carbon huggers. And the name “Le Caffage”? It’s a neologism, a made-up word alluding to the café style, and came out of a conversation between Gustavo and a French friend. 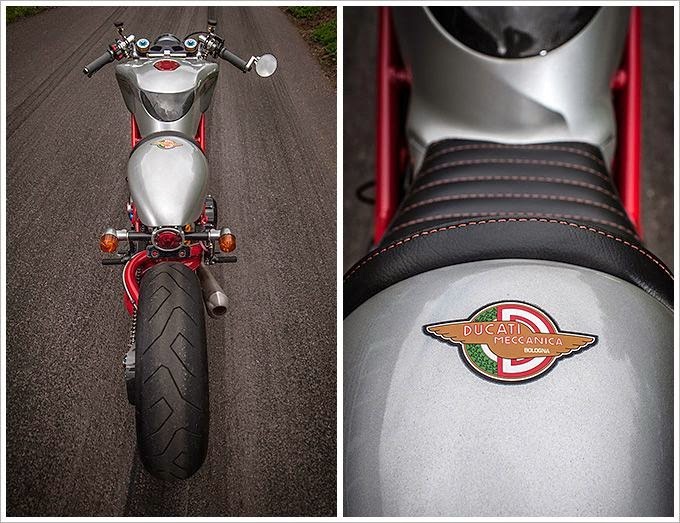 If your appetite is whetted, you’ll be glad to know that a limited run of Apogee Ducatis has just started. The donor bikes are not only the Ducati 848, but also 1098s and Streetfighters. And each will have its own distinctive characteristics. To put a true original in your garage, drop Gustavo a line via his website. 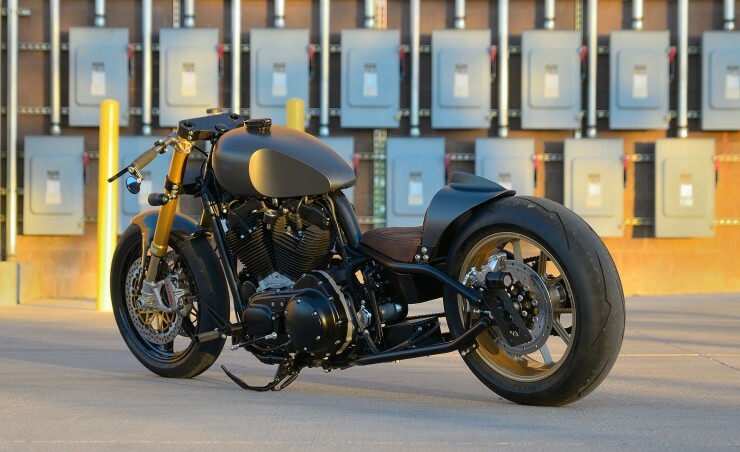 Austin's Revival Cycles continue to raise the bar with their impressive build portfolio and their latest custom creation is a jaw dropping masterpiece. Based on what was once a bright yellow, full faired 1997 900SS, their J63 Cafe Racer is a nut and bolt reincarnation of Ducati's venerable Super Sport. Exposing the bikes beautiful 90 degree v-twin, redesigning it's frame and modifying it's suspension were only the beginning of this comprehensive build, but it's the bikes unique bodywork that really makes it a cut above the rest. at the Revival workshop it was a neglected, incomplete restoration. After tearing off the stock plastics the engine was torn down to the crank and treated to an extensive overhaul. All new bearings, gaskets and rings were installed and the cylinders honed. The crank was balanced. valves renewed and the heads were ported and polished for maximum efficiency. 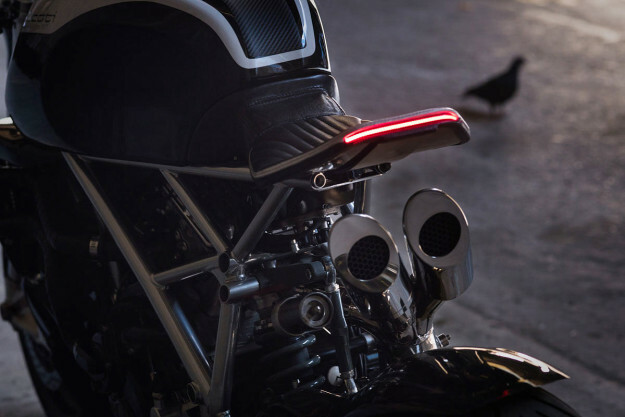 Twin Dellorto PH36 carbs with accelerator pumps now deliver the fuel to the engine and a custom stainless steel 2-into-1 system with hand formed silencer take care of the exhaust gases. To deal with the power gains the boys also upgraded the bikes clutch using a refurbished Ducati Corsa "slipper" clutch from a 1098. An upgraded stator and regulator/rectifier, ignition system, wiring loom and an antigravity battery make up the list of charging system upgrades, while LED lighting and Motogadget switches and electrical controllers modernise its electronic accessories. Revs and speed are displayed via a custom mounted Motoscope Classic gauge and for the information hungry rider it'll also report on top speed, oil pressure, average speed, voltage, current selected gear and the all important 0-60mph times. 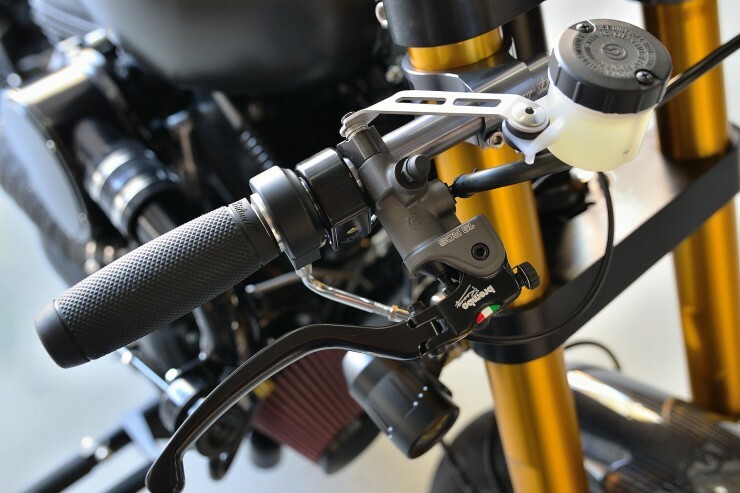 Handling upgrades come in the form of fully adjustable Öhlins cartridge shocks and a set of upside-down telescopic forks taken from a Ducati Sport Classic. Braking is managed by Brembo in the rear and Discacciati up front and the wheels are custom laced Sport Classic rims wrapped in Avon rubber. The high mounted clip-on style bars are a work of art and are, of course, custom made. You'll also find a set of custom rear-sets for foot controls and a top triple clamp all milled at the Revival workshop. The trellis frame of 900SS also underwent custom modification to create a more balanced stance and prepare it for the fitment of the new bodywork. Using hand forming techniques aluminium sheet was shaped to create the J63's slender tank and tail. 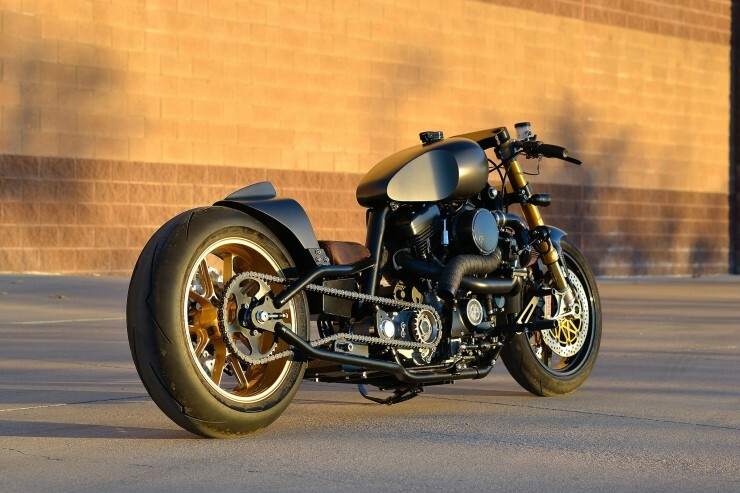 By having the bodywork run parallel to the road and tapering the tail off sharply the bike has an awesome feeling of speed even when it's sitting stationary. Countless hours of polishing have resulted in mirror finishes on almost all of the bikes alloy components and to add a final touch of colour the boys added deep red grips and a beautifully made, diamond stitched seat. 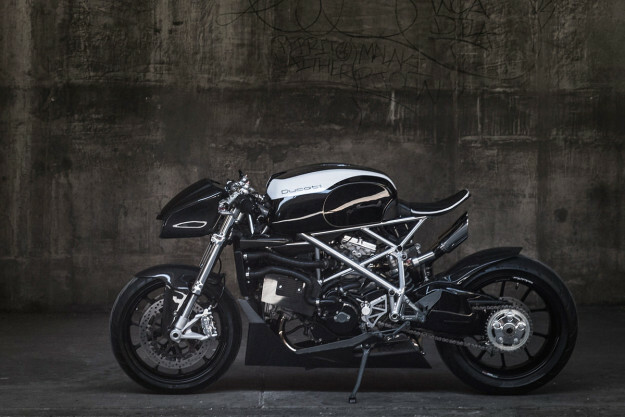 Picturing the Revival Cycles J63 as the plastic covered, 90's sports bike it once was is now almost impossible and quite frankly I much prefer gazing at it now. 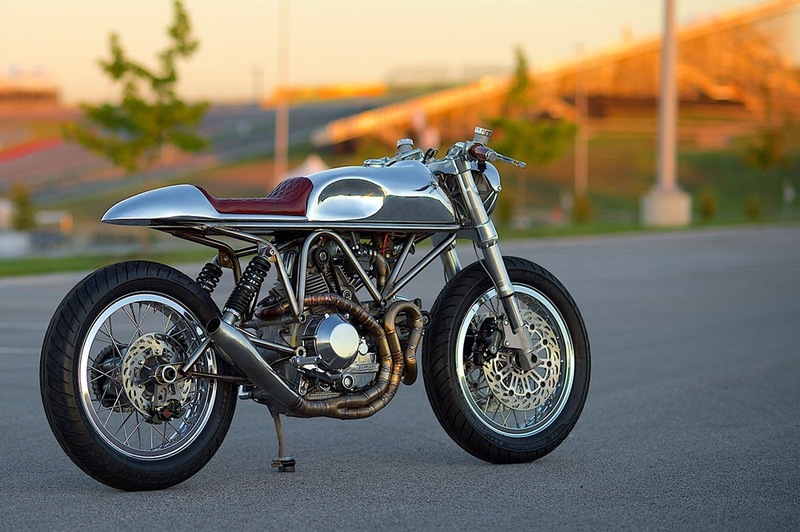 The Ducati 900SS is a motorcycle that’s rapidly becoming a bit of a modern classic, custom bike builders have been discovering the raw mechanical beauty that lies just beneath the original fairings but no one has quite showcased the 900SS as well as Old Empire Motorcycles with the example you see pictured here. 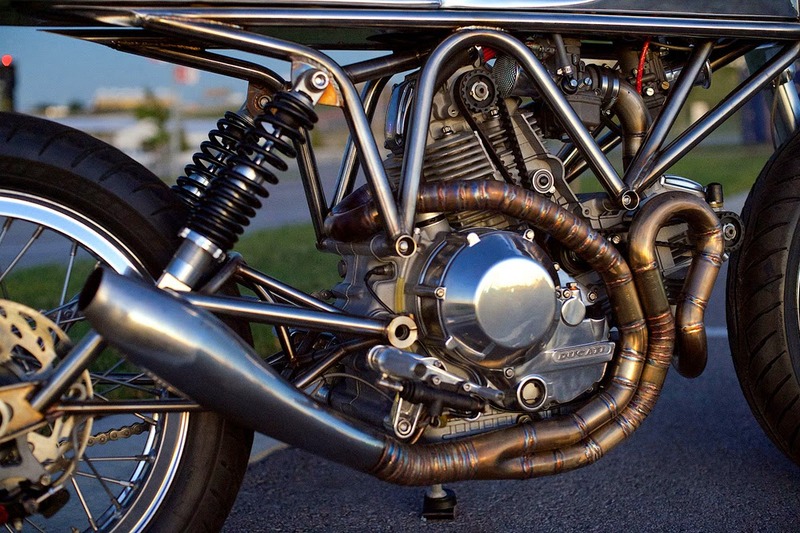 The bike started life as a 1995 900SS with its iconic Pantah-based 904cc air-cooled L-twin, each cylinder is fed by two Desmodue valves and the crankcase was a modified version of the one used on the Ducati 851. This engine has long been a favourite amongst the Ducatista and from a purely aesthetic standpoint it looks like it belongs in a modern art museum in between a Series I E-Type Jaguar and a Riva. 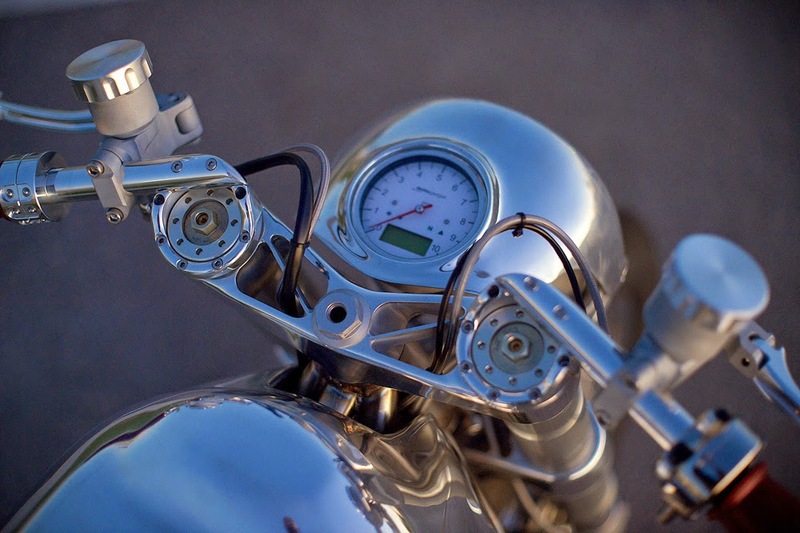 Ducati had introduced the 900SS in 1989 and although it was beautiful and highly capable, it frequently suffered from cracked swing-arms – so in 1991 Ducati introduced an upgraded model with a chrome-molybdenum steel trellis frame and bearings rather than bushings where the previously problematic swing-arm attached to the frame. This new version was a revelation, it offered impressive reliability with tire melting performance and looks that would go on to influence motorcycle designers around the world. 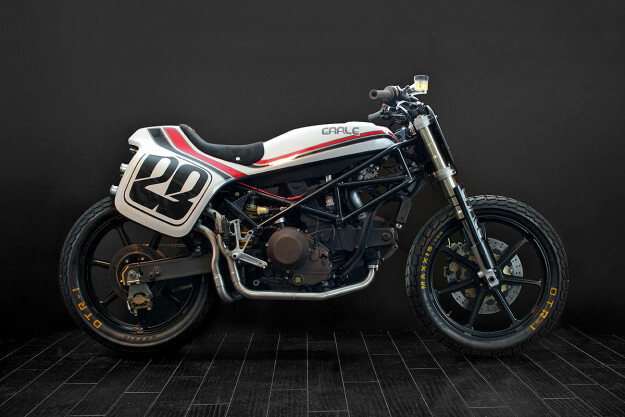 By the late ’90s the Ducati Monster had begun to steal some of the limelight from the 900SS due to its lower cost and more beginner-friendly handling, by 1998 a redesigned version was released with somewhat controversial styling – this has led to the popularity now seen around the 900SS from the model years 1991 to 1998. 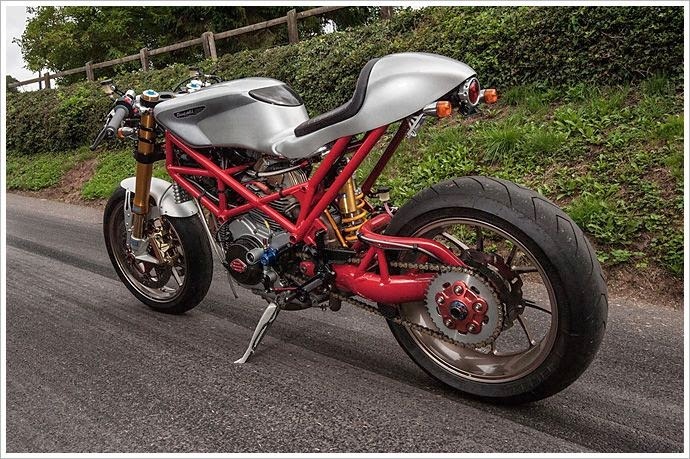 As you can clearly tell, the Ducati you see here has undergone an intensive custom rebuild and many parts from the original bike are now in the parts bin. 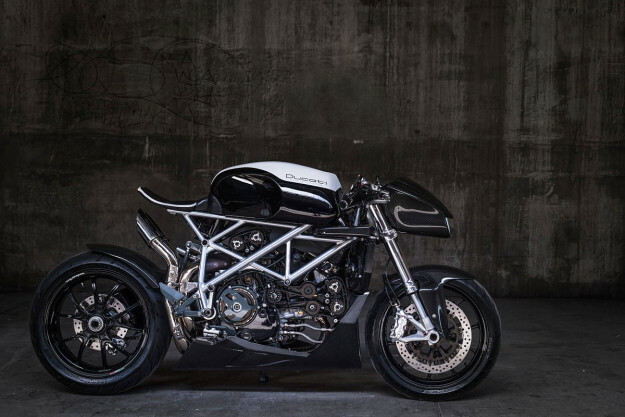 Looking at the design closely it gives an impression of what Ducati would have built if they were competing with Indian, Harley-Davidson and Cyclone on the board track circuits of the United States throughout the 1910s and 1920s. Any regular visitor to Silodrome will be well aware that we have a significant soft spot for anything board track related and I have vague memories of writing an article a few years ago demanding that the frequently lethal sport be brought back with immediate effect. I’m reasonably sure I even offered to bring my own hammer to help build the wooden tracks. 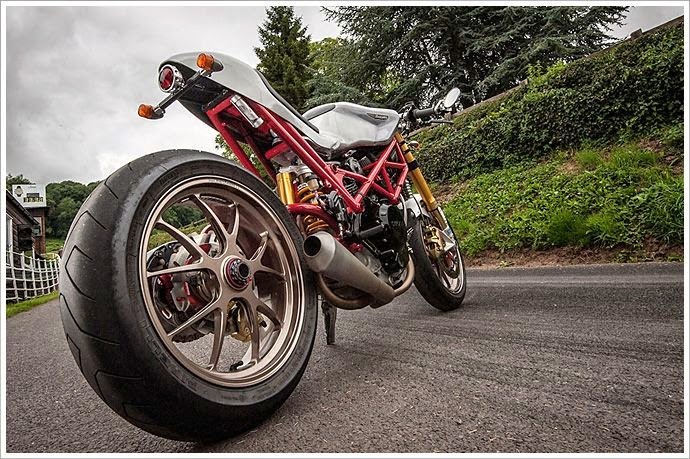 With this in mind you can imagine how interested we were to receive a folder of images from the team at Old Empire Motorcycles containing the Ducati pictured here. The build project took them almost 2 years and unlike the other customs they build, this one wasn’t built for a client. It was a personal project for the team and the freedom afforded them by not having to keep a client happy allowed them to throw out the rule book and fire up the acetylene torch. 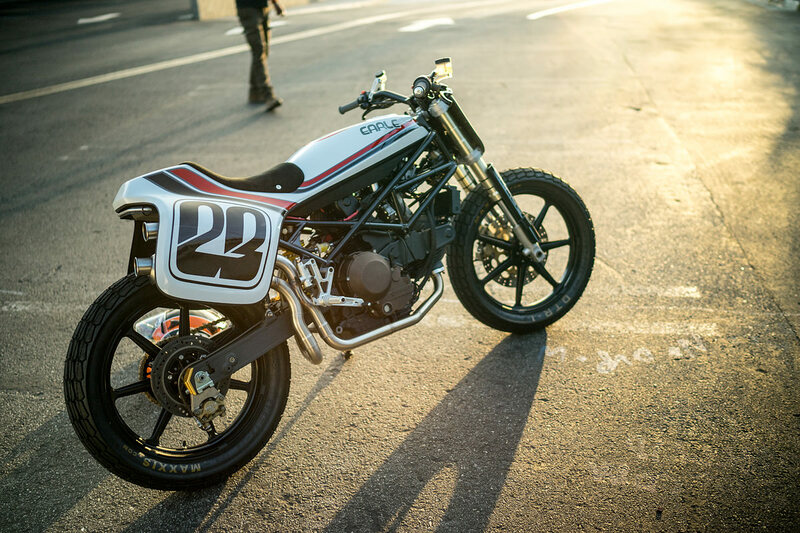 Perhaps the most immediately eye-catching element on the build is that Girder fork front end and brass headlight, when combined with the 21″ front wheel and quad leading shoe drum brake you’d never know that the bike was less than 20 years old. A single leading shoe drum is installed inside the 21″ rear wheel and the swing-arm has been entirely removed in favour of a solid rear – far more fitting on a motorcycle designed to race on a circuit made of two-by-fours. 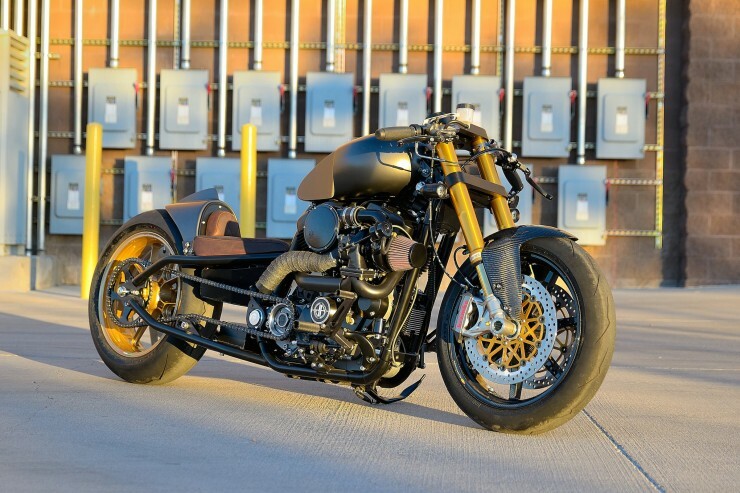 The copper tubing and braided wiring around the engine are tasteful touches, as is the extensive use of brass and leather. 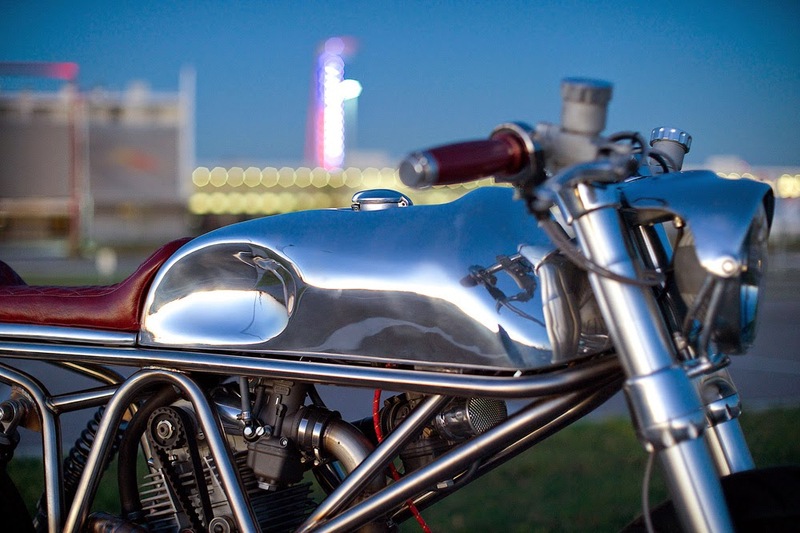 The fuel tank is a hand-fabricated twin-tank with copper plugs and the seat is a similarly handmade unit – the guys at Old Empire tell me that the seat is perfect for blasting around British B-roads but is probably not entirely suitable for long distance motorcycle touring. 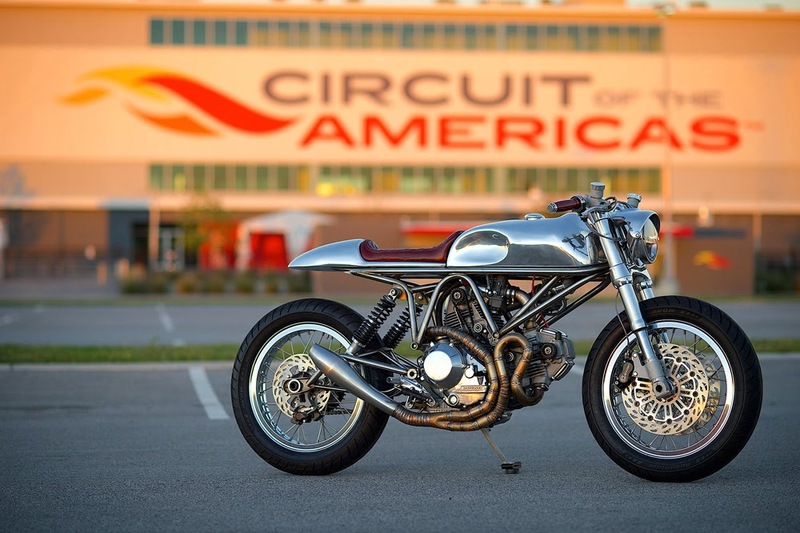 If you’d like to read more about this Ducati or see some of the other custom motorcycles to roll out of the Old Empire garage you can click here to visit their official website. 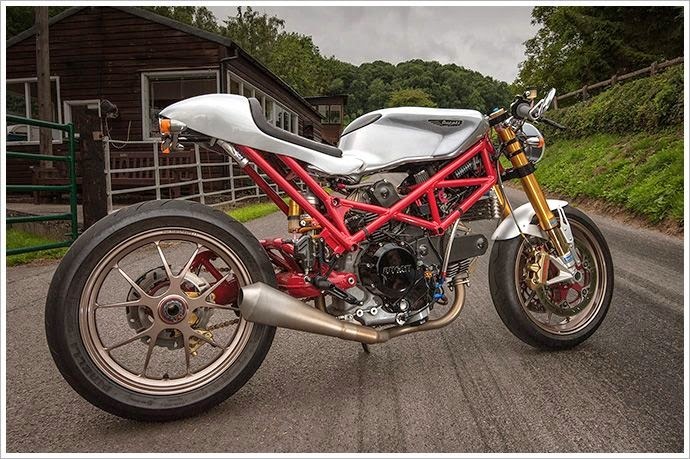 Ducati Cafe Racer based on Ducati Monster SR2 built by mechanical engineer John Grainge. 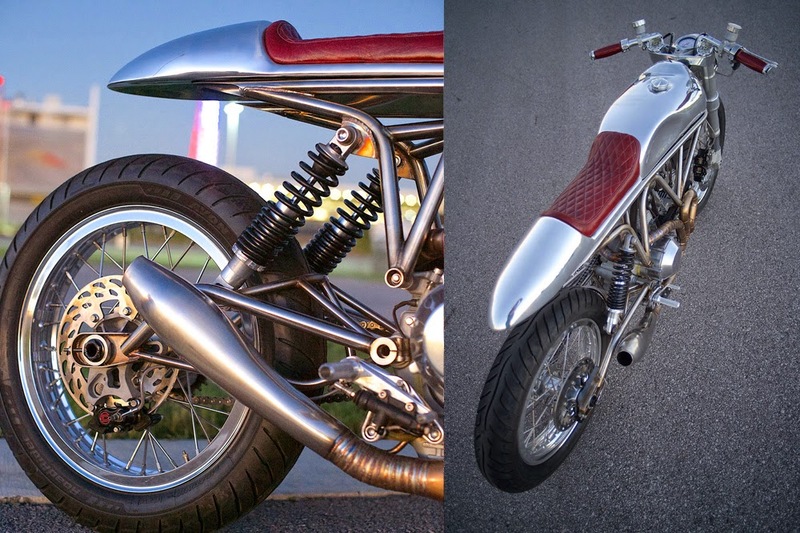 Custom Cafe racer seat by Radical Ducati, sub-frame was rebuilt, Custom fuel tank mounting and rear set was machined by john. Fuel tank was borroed from Ducati 749 and customized, Ohlins front suspension and disc brakes from Ducati 848, Ohlins rear suspension from Ducati 999, Ducati Hypermotard 1100S Marchesini magnesium wheels, Harley-Davidson V-Rod headlamp, Custom Exhaust system, custom Paint job by Alan Stanley, electrical Redesigned. 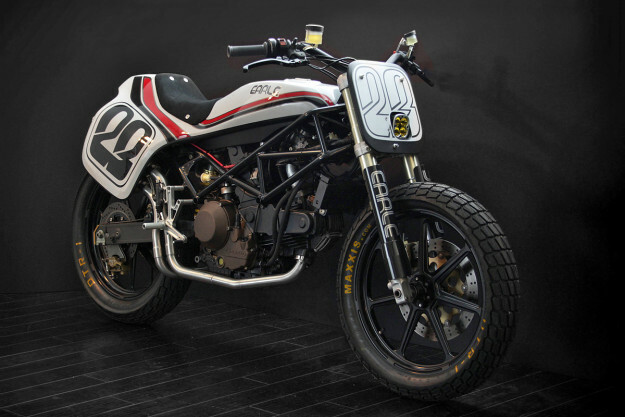 Ducati Monster SR2 Cafe Racer is unique and is an assemble of best parts from all Ducati motorcycles. It’s always a staff favourite when we get the chance to feature a turbocharged motorcycle here on Silodrome, motorcycles usually have a power to weight ratio so absurd that adding a compressor into the mix is usually considered an unnecessary complication. Fortunately though, the team at DP Customs love nothing more than a little in the way of unnecessary complication. Especially if it makes things faster. 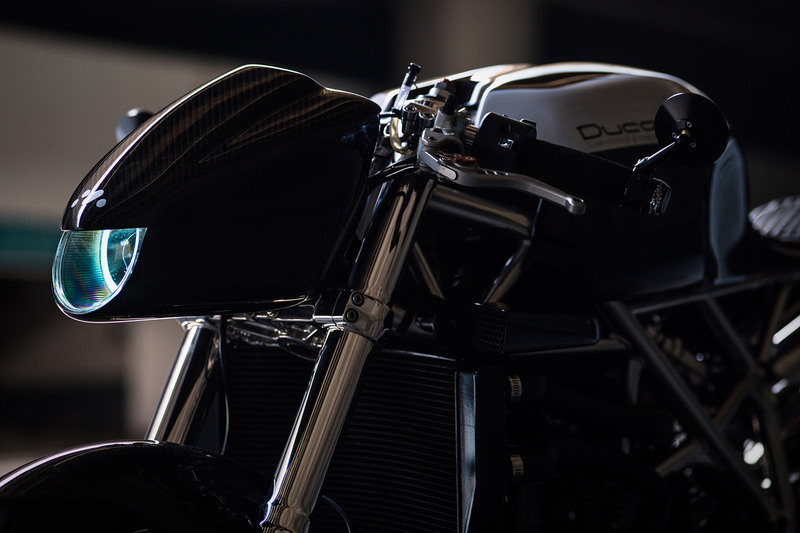 With a rear wheel horsepower rating of 154 and 132 torques (as Clarkson would say) this is an air-cooled 1200cc Harley-Davidson V-Twin that can mix it up with the likes of Ducati and KTM. 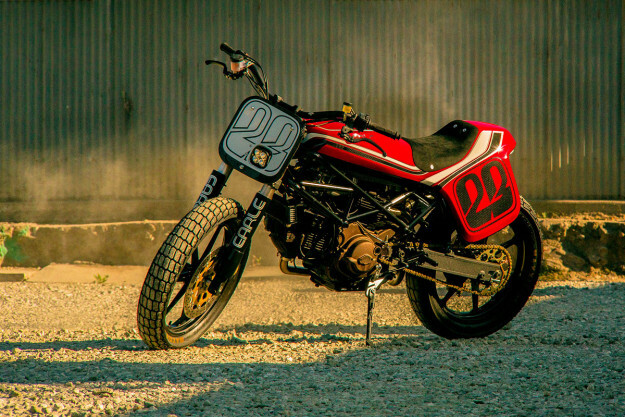 The engine was built by Trask Performance and features a welded crank, Screaming Eagle heads and a Thundermax ECU – the turbo generates 14PSI and is fed by a lone pod air-filter. 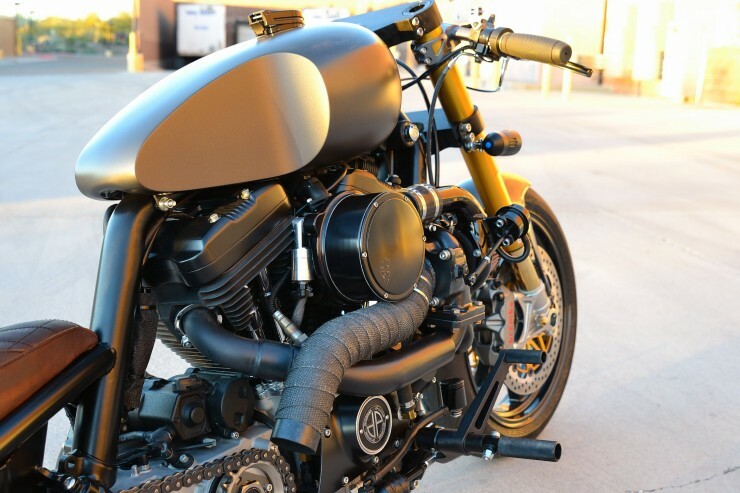 The frame has had its rear cropped and replaced with a custom 8″ stretch drop-seat hard-tail, the oil tank, seat pan and battery box were all then fabricated in house and fitted. The fuses/circuit breakers etc. are housed in a custom enclosure below the seat, and the Thundermax tuner is in the rear cowl. 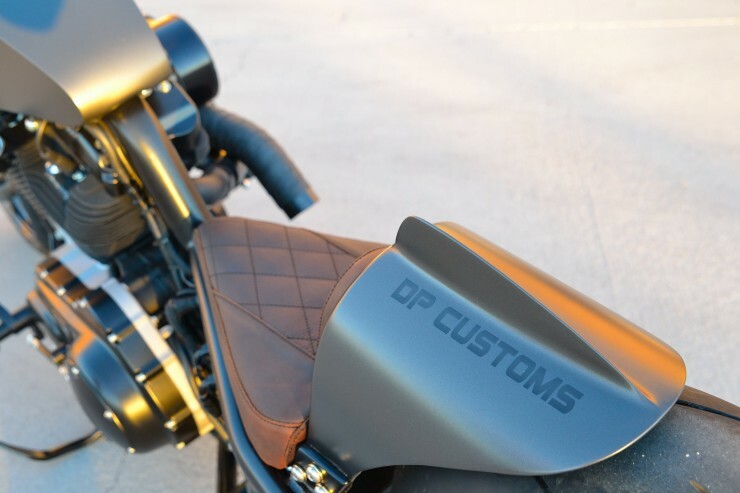 The fuel tank started as an original Harley OEM unit that was chopped and redesigned by DP Customs to suit the look and feel of the new bike. 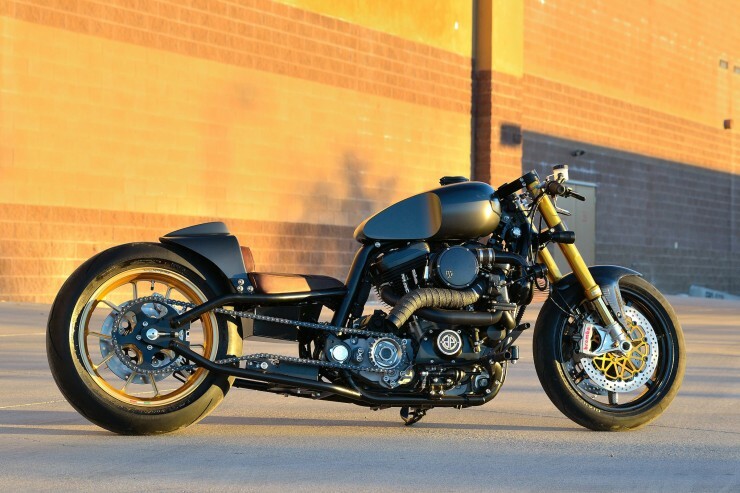 The Turbo Sportster’s front end has been fitted with Ducati 1198s grade Öhlins forks with custom spacers from Kyle Racing, the brakes are Brembo Monobloc units with a Brembo RCS master cylinder and the front wheel is a carbon fibre model from BST. That Ducati front end was fitted to the Harley frame by way of a custom triple tree from Shane over at Chainsikle - this isn’t the kind of work you’d trust to just anyone either, Chainsikle has just over 10 years of experience building bespoke parts for Sportsters just like this one. 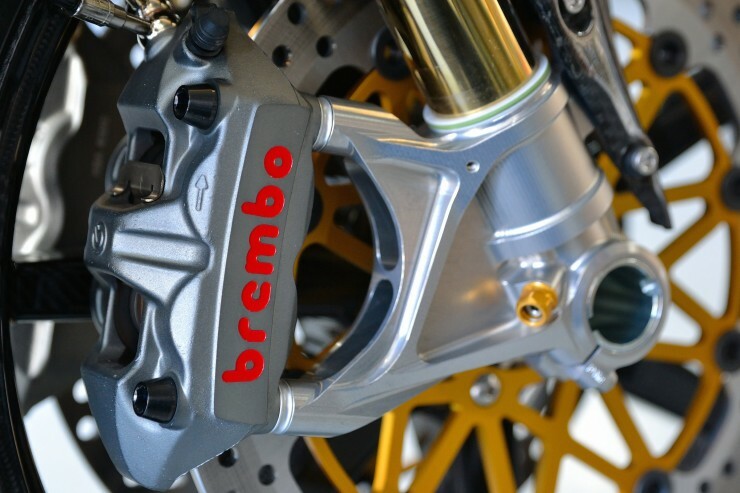 Rear braking is also handled by Brembo and the rear wheel is a forged aluminium Marchesini unit, with no rear suspension that rear wheel takes huge loads under heavy acceleration so the race-spec forged aluminium will go a long way towards avoiding your timed run ending in a shower of sparks and 4 inches less ground clearance. 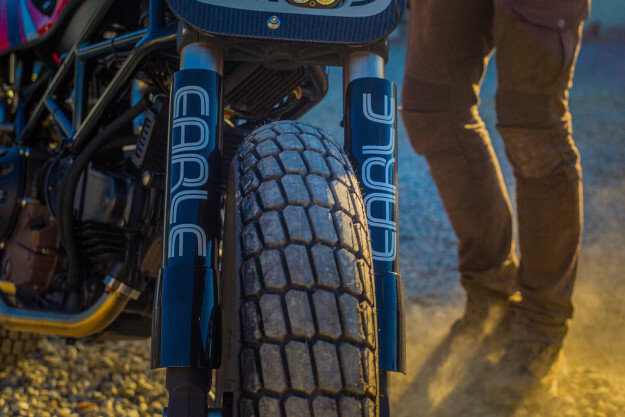 The team at DP Customs chose Pirelli Diablo Super Corsa SP tires for both the front and rear – just about the stickiest road-legal tires you can buy in many parts of the world. 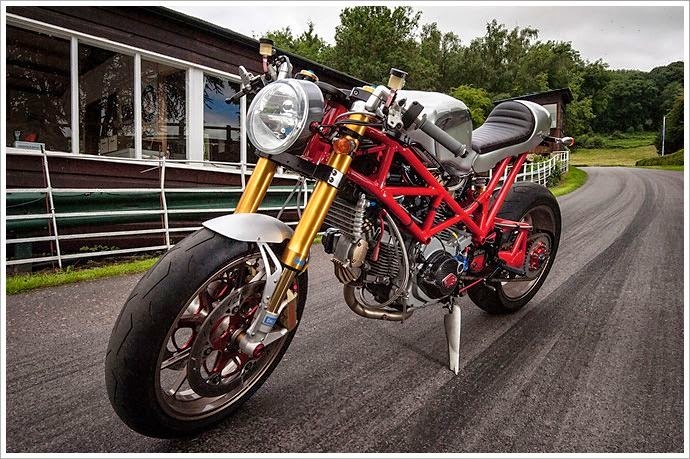 Sadly we haven’t yet see any video footage of this bike under hard acceleration, although it isn’t hard to imagine that the noise from those straight pipes combined with the turbo whine would sound like something akin to the voice of a drunk Norse god. 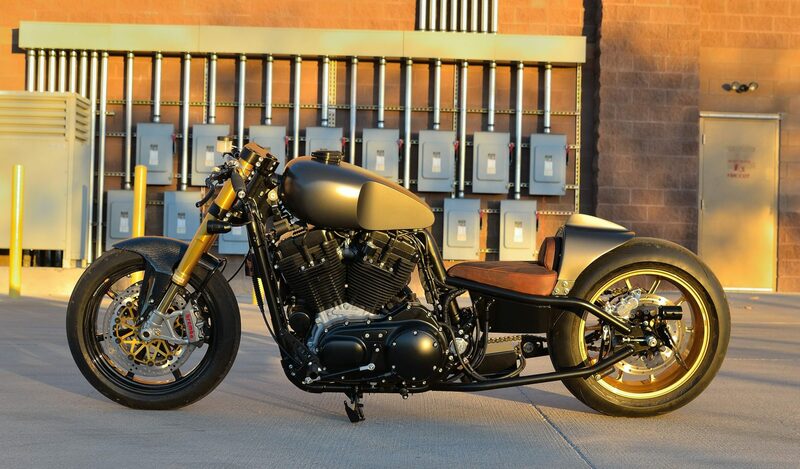 See more bikes from DP Customs here.